Chicago is currently in that #3 spot is the largest metro area in the US but by 2030, the Dallas-Fort Worth region may be sinking into that third spots. The Dallas-Fort Worth area added the most new residents of any Metro area in the country, roughly 400 per day or a total of over 146,000 over the year. We are currently in the nation’s #4 spot and with thousands of people moving both in from other states and abroad, Texas’s population boom, especially in the Dallas-Fort Worth area, is quickly making plans to be the3rd in the nation. City Councilman and leaders have clearly made a point of talking about our areas low cost of living and business-friendly environment. Many headquarters and companies are setting up shop in this area and on the list of counties and saw the biggest gains over the year, 6 out of 10 were in Texas, including Denton and Collin Counties. When both of these counties were smaller, they were up in the top 10 in terms of rate of growth, but now they’re cracking that 10 spot because of the amount of foundation and resident pull there is here. The economic development that’s going up is drawing migrants into these counties not only from out of state but out of the country as well. This is where Chicago is losing its ground. Chicago’s annual growth has been the slowest of any of the nations 12 biggest metro areas. 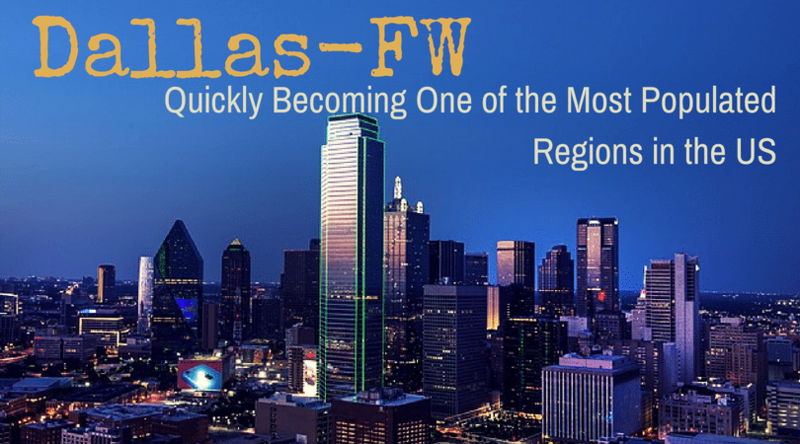 But the Dallas Fort Worth area ranked second behind Phoenix, which adds thousands of residents just last year alone. Chicago lost more than 13,000 residents and Cook County, home to Chicago, lost the most people of any county in the country. It’s hard to pinpoint exactly when we will surpass Chicago but, if they continue to lose population and growth, it’s a no-brainer for the Dallas-Fort Worth area. All of this to say, if you’re planning on moving to the Dallas-Fort Worth area, it’s a great idea to do so sooner rather than later. The cost of living will continue to increase but if you’re planning on moving within the next five years, moving now to the Dallas area and selling in 5 to 10 years might gain you a substantial profit. It’s important to look at least 10 years down the line to find the best place to live now and for the best profit in the future.